The Tampa Bay Buccaneers attendance issues have become so problematic that they’re resorting to giving away free tickets. Buccaneers season tickets holders are being given two complimentary tickets each for Sunday’s game against the Carolina Panthers. This initiative comes after the team suffered their worst home attendance in more than eight years. In a win over San Francisco on November 25, only 40,682 were at Raymond James Stadium, which holds 65,000 for football. Some in the local media were quick to point out that more people attended a college football game in the same stadium two days earlier. On November 23, 57,626 people attended the University of Central Florida’s 37-10 win over the University of South Florida. But if fairness, it should be pointed out that USF is located in Tampa and UCF is located about an hour down the road in Orlando. So, it was a neighborhood battle between two local schools. Also, UCF, which has the largest enrollment of any college in country, is in the midst of their second consecutive undefeated season. So a lot of UCF students make the trek from Orlando for this game. The Buccaneers aren’t creating nearly has much excitement as UCF, and it’s reflected in their poor attendance. The Bucs are 4-7 on the season, and likely en route to their seventh losing season in the last eight years. They also have uncertainty at the most important position in NFL football – quarterback. The last couple of years they’ve bounced back-and-forth between 2015 first-round pick Jameis Winston and veteran Ryan Fitzpatrick. The NFL is a QB-driven league, and if you don’t have a top-shelf answer at the position it’s hard to be successful. Also perhaps not helping Tampa Bay’s attendance was Winston being accused of groping an Uber driver in Arizona, which was just settled out of court. The NFL suspended him the first three games of the 2018 season for this incident that reportedly occurred in March, 2016. Some fans claimed over the summer they won’t support the team with Winston on the roster, so that could be hurting attendance as well. It’s also possible that some NFL players protesting during the national anthem the last couple years has hurt attendance. Tampa has a large military presence as home of MacDill Air Force Base. Another factor in Tampa’s attendance issue, which isn’t new, is the area’s loaded with transplants from other areas who still root for the NFL teams in their former cities. So often the games with the best attendance are Tampa Bay contests against teams from the northeast and rust belt. For example, on September 24, the Pittsburgh Steelers visited and the stadium was at full capacity. Some referred to the game as a “Steelers takeover.” But teams from Pittsburgh, Buffalo, New York and Cleveland don’t play at Tampa that often because they aren’t in the same division. Which leads to some attendance debacles like what occurred in the San Francisco game. 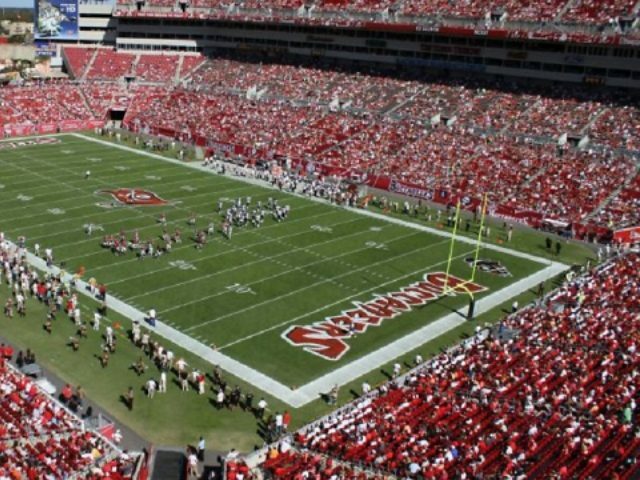 The Buccaneers have two homes games after the Carolina contest, but management hasn’t stated whether they will continue their free ticket promotion for the games against the New Orleans Saints and Atlanta Falcons.